46 x 30 cm - 18 1/16 x 11 3/4 in. 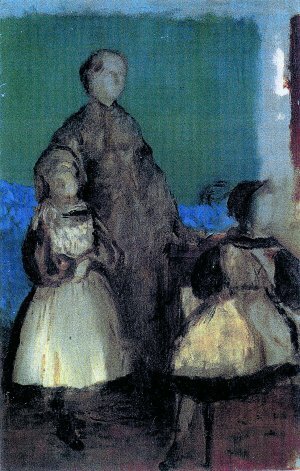 Atelier Degas - Vente Degas, 1919, IV, n° 13 (repr.) - Durand-Ruel & Co., Paris - Hugo Perls, New York, 1927 - Collection particulière, 1937 - Vente Sotheby's, Londres, 30 juin 1998, n° 2. Copenhague, Ordrupgaard, 1983, n° 18 (repr.). Hertz, L'Amour de l'Art, mars 1924, p. 72 (repr.) - Mauclair, 1937, Degas, p. 57 (repr.) - Lemoisne, 1946-1949, II, n° 63, repr. p. 31 - Reff, More Unpublished Letters, 1969, p. 282 - Dunlop, 1979, p. 39 (repr. ).